Hi everyone! Welcome to Satur-YAY! We're celebrating the weekend by getting our craft on. And I'm here with one of my favorite Copic techniques, Copic coloring on vellum. Today's card features the Oh Hello Friend stamp set from Flora & Fauna. It's a fun, whimsical floral set that can be used for Copic coloring, watercolor, and even for a fun and funky black and white background. I started by white heat embossing my images on some heavy weight vellum from the Essentials By Ellen line. This is my FAVORITE vellum. I created a grouping of stamped images and masked the images to overlap them. Once my images were stamped and white heat embossed, I flipped the vellum over to color on the backside using my Copic markers. You'll want to color on the backside of your vellum because the Copic markers can eat away at your heat embossing and leave the tips of your markers in bad shape. Also, by coloring on the backside, the color is defused and helps to disguise the streaky appearance that you can sometimes get when coloring with Copics on vellum. Here are a few more tips for Copic coloring on vellum. Choose colors that are a little bolder than you may think you want. The colors are a bit muted when looking through the vellum. The transparent nature of the vellum leaves you with a more muted tone than the same color on white card stock. You may want to do some test swatches on a scrap piece of vellum prior to coloring on your project. If you mess up...don't scrap the whole thing. Copics can easily be removed using a bit of rubbing alcohol or the Colorless blender. Sometimes you are left with a slight trace of the color left behind, but once you color it again with a new color, you're good to go. This works better with lighter tones than darker tones. You can create a watercolor effect by coloring large areas and then blotting it with some Colorless Blender Solution or rubbing alcohol. I love to create faux watercolor backgrounds using this technique. I'll walk you through the creation of this card in the video tutorial below. Be sure to check that out. I think you'll pick up a few tips along the way AND I know you'll see me mess up a time or two. ;) That's okay. It's the end project that matters, right? Now that you've seen it, it's your turn to create something. There's not better way to spend your Satur-YAY than by celebrating with a little crafty session. Get your craft on and show me what you made using #EllenHutsonSaturYAY! I can't wait to see what you create. Thanks for stopping by. I hope you've enjoyed this project. Until next time, I hope you have a fabulous day! Hey everyone! Happy Satur-YAY! We're celebrating the weekend by getting our craft on. And today, I'm going to give you a look at the Ranger Distress Oxide Inks. You're going to love these inks! The Distress Oxide inks are a unique fusion of pigment and dye ink. They're water reactive like traditional Distress Inks. The pigment ink properties of them make them better for stamping and make blending easier (for those of you who are blending challenged like myself). They're water reactive, making them perfect for techniques, watercolor and more. The pigment properties of this ink make it great for embossing. The opaque nature of these inks leave you with beautiful, solid stamped images. The vibrant colors are true to my favorite original Distress Inks and make rainbow blending a breeze. When sprayed with water, the inks create an oxidized effect and leave you with a velvety, chalk like look. The pigment properties keep these colors true, even on dark card stock. In the video tutorial below, I'm going to take you through some of the basics of the Distress Oxide inks and walk you through a couple of projects. Be sure to check that out! I think you'll find it very helpful. I created two types of backgrounds. The first background I created by pressing my paper in to wet Oxide Ink on my craft mat. I then layered some ink blending on top to intensify and add color in areas. I dropped some water droplets on top of my background to lift color in random areas. The second background was created with ink blending. This technique is definitely more controllable and predictable than the first technique. I actually did my ink blending on traditional Neenah Solar White card stock. I wanted to use this particular card stock to show you that blending is easier with these. I find it very difficult to achieve a smooth blended look on traditional Neenah card stock...so if I can create that smooth look with the Oxide Inks on Neenah...I've found the holy grail of ink blending. I finished both of the cards off with a misting of Sparkle Shimmer Spritz to make them very sparkly. This can be tricky. You don't want the mist to be so heavy that you move the ink. Make sure you spray in light mists from high above to avoid reactivating your Distress Oxide Inks. I love the super shimmery effect you can achieve with this Spritz. Thanks for stopping by today. I hope you've enjoyed this look at the Ranger Distress Oxide Inks. And I hope I've inspired you to get in your craft space and get creating. There's no better way to celebrate the weekend. Until next time, I hope you have a fabulous Satur-YAY! Hi everyone! Welcome to Satur-YAY! We're celebrating the weekend by getting our craft on. I hope these projects leave you so inspired, that you can't wait to get in your craft space and create. This week on The CLASSroom blog, we've been playing with the Cosmo Cricket WIP Art Deck. I'm going to walk you through a few projects featuring some pieces from the Art Deck, as well as some shimmer watercolor with Daniel Smith Watercolor. Daniel Smith watercolors are fabulous, artist grade watercolors. The colors are beautiful and they are very easy to work with. Sandy did a whole series on these watercolors. You can check out those videos by clicking HERE. Today, I'm going to be doing some basic watercolor with the Daniel Smith watercolors. But in true Carissa fashion, I'll be adding a touch of shimmer to the watercolor with the Daniel Smith Pearlescent Shimmer watercolor. This sheer, shimmery watercolor can be mixed with any watercolor to give the finished product a beautiful shimmer and shine. And what's a handmade card without some shimmer and shine? The Pearlescent Shimmer is very easy to use. All you have to do is pick a little up with a damp paint brush, just like you would your regular watercolor, and mix it in to the color you are using. Want more shimmer? Just add more. Want a very subtle shimmer, just add a teeny amount. I didn't do a lot of mixing of colors for these cards. I fact, I was so enamored with the Amazonite Genuine when I tested it out, that I couldn't bring myself to venture out from there. I ended up using this color on several of my cards. The Cosmo Cricket WIP Art Deck is full of preprinted designs on watercolor paper. The designs include gold foil and clear embossed images. The clear embossed images appear when you add color over the top of them, just like the emboss resist technique. This Art Deck is full of fun phrases and images in all different sizes. I am adding watercolor over the top today, but you could add any kind of water based ink over the top to make the emboss resist areas pop. The foiled areas act like emboss resist as well. They also help contain the watercolor within boundaries...you'll see me paint in some letters in the video tutorial. I love that I feel like I've created a masterpiece with just a quick swipe of a paint brush. Once watercolored, these pieces make perfect focal images for card fronts. I wanted the beauty of the shimmer watercolor to take center stage, so I kept the cards and embellishments very simple. I'll walk you through the creation of these cards in the video tutorial below. Be sure to check it out. As I said before, the beautiful designs of the Art Deck, along with the watercolor call for very little embellishing. These are so easy. Dare I say, "Even a caveman could do it"? I hope these card projects have inspired you to get your craft on today! What better way to spend the weekend than creating a little handmade somethin somethin? It's you're turn now. I'd love to see what you're creating. Be sure to share your creations on social media using #EllenHutsonSaturYAY. Thanks for stopping by today! I hope you enjoy these projects. I'll see you on the last Saturday of next month for another Satur-YAY. Until then, I hope you have a fabulous day! You can watch this video in HD on our YouTube channel by clicking HERE. Don't forget to subscribe while you're there so you won't miss a single video. Hi everyone! Welcome to Satur-YAY! We're celebrating the weekend by getting our craft on! Today I have a fun see through shaker card for you. The window goes all the way through the card...you can see right through the entire card. Cool, right? I'm using the Advent stamp set and the Zipper Panel die set from the Essentials By Ellen line. The intricate sentiments from the Zipper Panel die set are some of my favorites. And they look SOOOOO amazing cut from gold glitter card stock. In the video below, I'll show you how to use the We R Memory Keepers Fuse Tool to create a custom sized and shaped shaker pocket. These types of shaker pockets allow you to create a more flat shaker card. Since these cards are for graduates, I thought it would be fun to make some in school colors as well. My daughters school colors are mainly black and gold. They're actually brown and gold, but the kids hate the brown so they pair the gold with black instead. Teenagers. ;) My niece's school colors are green and white. So I chose some green seed beads along with some sparkling clear and gold sequins for her card. You can use any colors! Or choose softer colors for a baby card. As always, I hope this project inspires you to get in to your crafting groove and get creating. I'd love to see what you're making. 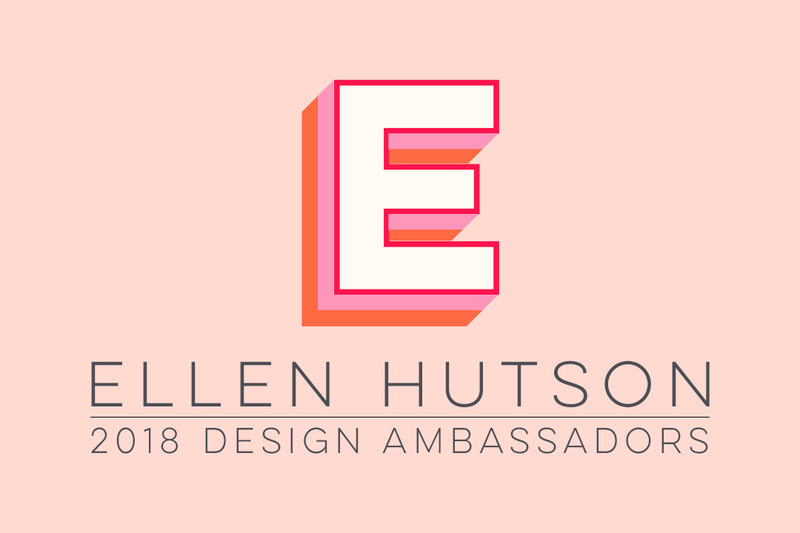 Be sure to share it on social media and use #EllenHutsonSaturYAY when sharing so I can check it out. Thanks for stopping by today! Happy Satur-YAY! It's time to get your craft on! Until next time, I hope you have a fabulous day!